This is a small trick to avoid losing track with magazine articles that are not that interesting to you: focus on the most interesting articles. With IT magazines going from a monthly to a bi-weekly basis without getting much thinner, I had to come up with a clever way of keeping focus. I was not able to read through all the articles I found interesting. Mostly, because I do find almost anything interesting to read. Here is my trick: I read the table of contents and optionally skim through the magazine. The articles I definitely want to read, get a small Post-It at the very bottom of the right hand side. Articles I do find interesting but do not get priority get a Post-It a few centimeters higher. 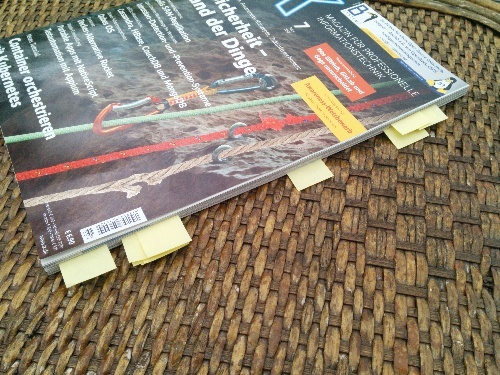 Post-Its on an IT magazine. From left/bottom to right/top: 1 priority article to read, several other articles to read, one with pending things and then all the articles that are read. When an article is read, its Post-It gets moved to the top part of the page. Whenever I read an article and there is something I want to get back to later on, I put the Post-It in the middle of the page. This way, I concentrate on reading the most important articles first without getting lost in all that wonderful stuff within IT magazines.